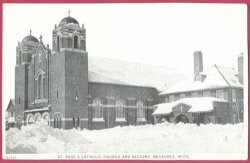 Title: St. Paul's Catholic Church and Rectory, Negaunee, Mich. Condition - Good to very good. Light corner wear. Small crease in bottom left corner and a couple of slight bends (not serious).